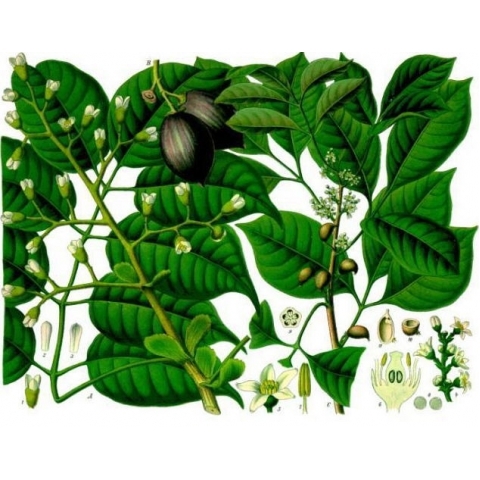 Canarium luzonicum, commonly known as elemi, is a tree native to the Philippines, and an oleoresin harvested from it. Elemi resin is a pale yellow substancfe, of honey-like consistency. 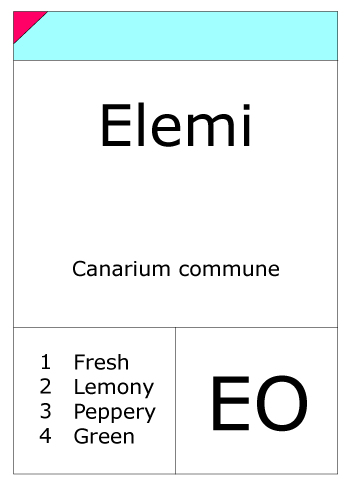 Aromatic elemi oil is steam distilled from the resin. It is a fragrant resin with a sharp pine and lemon-like scent. One of the resin components is called amyrin. 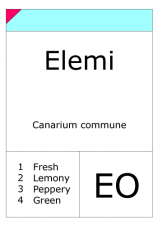 Elemi has a spicy, incense-like scent that is soft and somewhat balsamic. A member of the same botanical family as frankincense and myrrh. Elemi resin is used commercially in varnishes and lacquers, and certain printing inks. It is used as a herbal medicine to treat bronchitis, catarrh, extreme coughing, mature skin, scars, stress, and wounds. The constituents include phellandrene, limonene, elemol, elemicin, terpineol, carvone, and terpinolene.